Of the three films set in the 1920s that were nominated for Best Picture at the Academy Awards this year (The Artist, Midnight in Paris, and Hugo), P&PC liked Martin Scorsese's Hugo the best. It wasn't even close. I mean, we enjoyed the others a lot—we did. The characters of Salvador Dali and Ernest Hemingway in Midnight in Paris had us clutching our sides and ROTFLOL. And we sat, like the rest of the audience at the Salem Cinema, stunned as George Valentin did the best reworking of the silent-to-talkie transition thing since Sunset Boulevard (and way better than the 1975 Merchant Ivory film The Wild Party, which we mention here mainly because we've got to give it props for being one of the few films ever based on a poem (Joseph Moncure March's jazzy, underrated, and once-controversial 1928 book-length poem of the same title). But Hugo's story of the 12 year-old fugitive orphan who maintains the clocks at the Gare Montparnasse and who serendipitously strikes up a relationship with a toy store owner who happens to be the silent film maker Georges Méliès in hiding just got us. 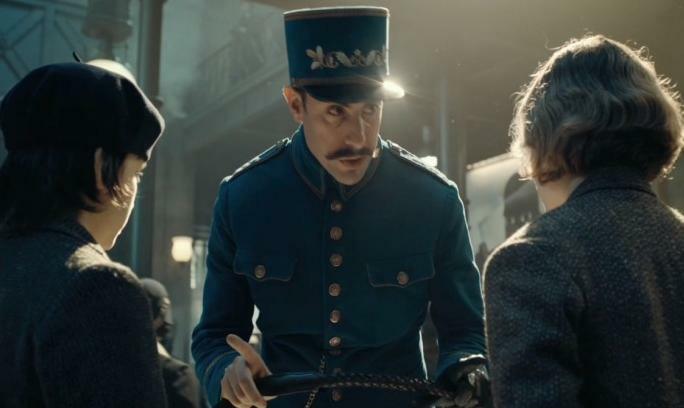 Based on Brian Selznick's novel The Invention of Hugo Cabret, Scorsese' movie had all the Parisian romance that Midnight in Paris did, and it had all the celebration of movies that The Artist did, but it had at least one thing that the others didn't: poetry. Gustave: Seems Maximilien doesn't like the cut of your jib, little man. He is disturbed by your physiognomy. He is upset by your visage. Why would he not like your face? Eh? Isabelle: Well, perhaps he smells my cat. 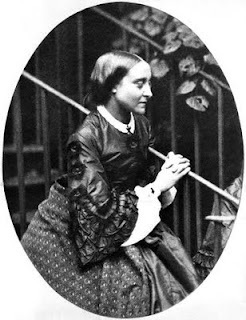 Isabelle: Yes, Christina Rossetti's her name, after the poetess. Would you like me to recite? 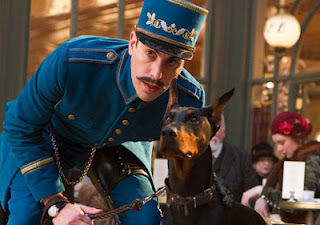 Gustave: Yeah yeah—she's one of my favorites. I know it's Rossetti. I know it's Rossetti. I love poetry, just not … in the station. We’re here … to get on trains 'n' get off 'em, work in different shops. Is that clear? 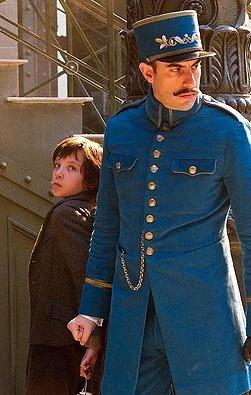 Gustave: Watch your step. Go on. Go! Fending off Gustave's advances, Isabelle is quoting the first four lines of Rossetti's "A Birthday," and one of the many compelling things about this scene and the role of poetry in Hugo is that there's no mention whatsoever of Rossetti in the original novel—it was added for the film. Even more curious than this, perhaps, is that the poetry that is mentioned in the book is left out of the movie. 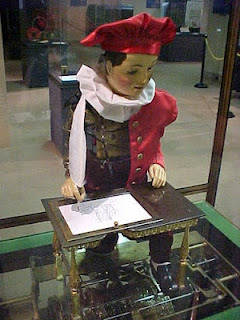 Apparently, as Hugo's father suggests in one of the novel's early scenes, and as Selznick explains in his acknowledgments, the automaton that Hugo is trying to repair—and that, in the story that the movie tells, once belonged to Méliès—is based on an actual automaton (pictured here) that was built by the 18th century Swiss mechanician Henri Maillardet. Now in the collection of the Franklin Institute museum in Philadelphia, Maillardet's automaton not only draws four different pictures, but it writes three poems as well, two in French and one in English. Examining the broken automaton in Selznick's novel, Hugo's father explains, "I'm sure that if it were working, you could wind it up, put a piece of paper on the desk, and all those little parts would engage and cause the arm to move in such a way that it would write out some kind of note. Maybe it would write a poem or a riddle. But it's too broken and rusty to do much of anything now.” Hugo's dad was right—one of the poems written by the Maillardet automaton is pictured here, and you can see a couple of videos of the machine working here—but Scorsese's automaton is, apparently, only capable of making pictures. We here at P&PC understand the movie logic, of course, which is also at play in other films like G.I. Jane, The Contract, and The Long Hot Summer that either construct their credibility as art in relation to poetry or else participate in waging what we've called a "strange, low-level, but ongoing smear campaign against poetry." 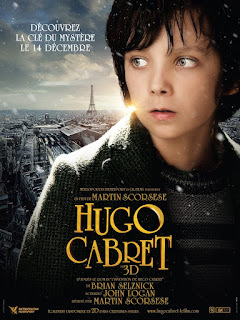 Hugo is ultimately about the magic of movies, and so the magical things in it must (so movie logic goes) be associated with visual phenomena—pictures that are moving both literally and emotionally—and not with what emerges, in the process, as the counter-discourse of words and their epitome: poetry. Rynn: Sorry, he's working. He's translating some Russian poetry. When that door is locked I can't bother him. 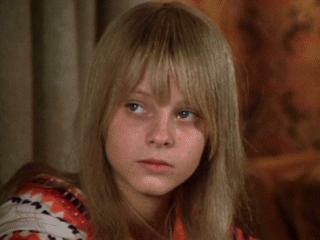 I suspect the only reason [landlord] Mrs. Hallet lets us into her village is because my father is a poet. Mrs. Hallet loves poets. That's one of his books over there. Miglioriti [picking up the book from the mantle]: He wrote that, huh? Rynn: Yeah. You want him to sign a copy for you? 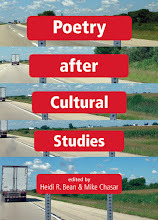 Miglioriti: Yeah, sure, I never met a real poet. I mean … Look, don't laugh at me, but I can't believe people like poetry. I'm not talking about that birthday card stuff, but real poetry. And when it doesn't even rhyme! Rynn: Oh, I'm not laughing at you. My father says that most people who say they like poetry only pretend to like it. You're honest. Miglioriti: He's your favorite poet, huh? Rynn: No, he's my father. 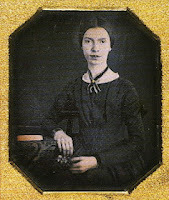 Emily Dickinson's my favorite. Hollywood hasn't been shy about linking poetry with criminals and other people trying to avoid the law: an escaped hit man played by Morgan Freeman quotes it in The Contract; it makes up the world through which assassin Martin Q. Blank moves in in Grosse Pointe Blank; it is quoted by Ponyboy in The Outsiders; it interferes with Daddy Varner's authority in The Long Hot Summer; it is linked with "England's greatest sinner" in Bride of Frankenstein; and it is written by Edward Norton's character in Fight Club. Trend? We think so. 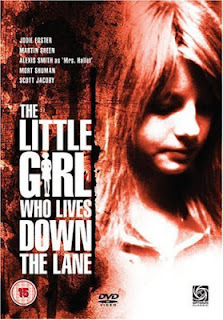 Both The Little Girl Who Lives Down the Lane and Hugo participate in this tradition, but in putting poetry into the mouths of juvenile female speakers, they turn it, we feel, in slightly different direction. We're not sure what that direction is at the moment. But like Gustave's doberman Maximilien, we're not entirely confident, here at the beginning of National Poetry Month 2012, that we like the cut of its jib—or its visage.